Food cannot be grown without water. 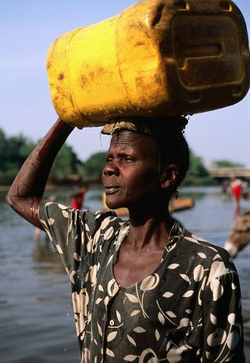 In Africa, one in three people endure water scarcity and climate change will make things worse. Building on Africa’s highly sophisticated indigenous water management systems could help resolve this growing crisis, but these very systems are being destroyed by large-scale land grabs amidst claims that Africa's water is abundant, under-utilised and ready to be harnessed for export-oriented agriculture. GRAIN looks behind the current scramble for land in Africa to reveal a global struggle for what is increasingly seen as a commodity more precious than gold or oil - water. The Alwero river in Ethiopia’s Gambela region provides both sustenance and identity for theindigenous Anuak people who have fished its waters and farmed its banks and surrounding lands for centuries. Some Anuak are pastoralists, but most are farmers who move to drier areas in the rainy season before returning to the river banks. This seasonal agricultural cycle helps nurture and maintain soil fertility. It also helps structure the culture around the collective repetition of traditional cultivation practices related to rainfall and rising rivers as each community looks after its own territory and the waters and farmlands within it. One new plantation in Gambela, owned by Saudi-based billionaire Mohammed al-Amoudi, is irrigated with water diverted from the Alwero River. Thousands of people depend on Alwero's water for their survival and Al-Moudi's industrial irrigation plans could undermine their access to it. In April 2012, tensions over the project spilled over, when an armed group ambushed Al-Amoudi's Saudi Star Development Company operations, leaving five people dead. The tensions in south western Ethiopia illustrate the central importance of access to water in the global land rush. Hidden behind the current scramble for land is a world-wide struggle for control over water. Those who have been buying up vast stretches of farmland in recent years, whether they are based in Addis Ababa, Dubai or London, understand that the access to water they gain, often included for free and without restriction, may well be worth more over the long-term, than the land deals themselves. In recent years, Saudi Arabian companies have been acquiring millions of hectares of landsoverseas to produce food to ship back home. Saudi Arabia does not lack land for food production. What’s missing in the Kingdom is water, and its companies are seeking it in countries like Ethiopia. Indian companies like Bangalore-based Karuturi Global are doing the same. Aquifers across the sub-continent have been depleted by decades of unsustainable irrigation. The only way to feed India's growing population, the claim is made, is by sourcing food production overseas, where water is more available. The reality is that a third of Africans already live in water-scarce environments and climate change is likely to increase these numbers significantly. Massive land deals could rob millions of people of their access to water and risk the depletion of the continent's most precious fresh water sources.